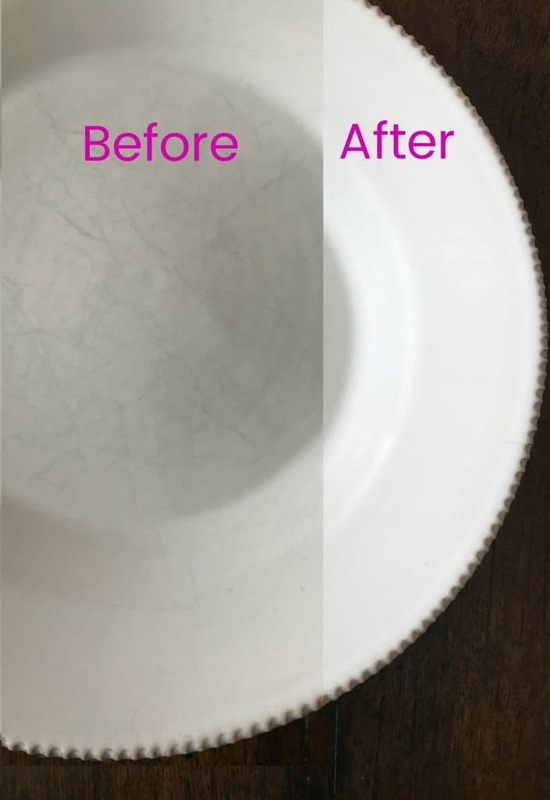 Have you ever had a set of light colored dishes that got grey scratches on them? I did…in fact, they were the everyday dishes from Pottery Barn we were given as wedding gifts. I love those dishes and thought they were damaged forever. 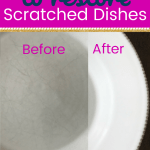 I thought the grey marks were a permanent change and didn’t realize there was an easy way to restore scratched dishes. 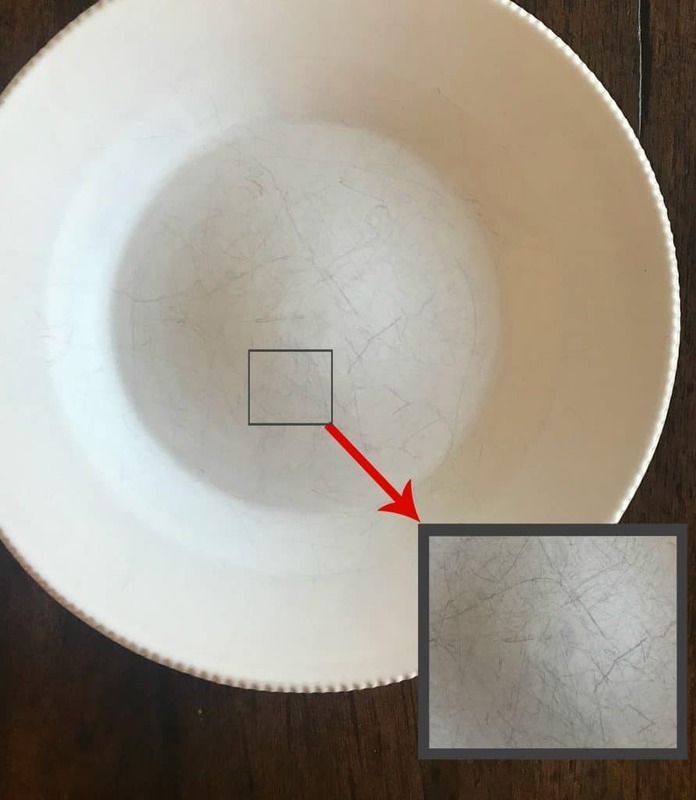 The “scratches” are not actually etched in the porcelain or pottery, but they are metal deposits from the silverware used every day to cut, scoop, or pierce the food you’re eating. In reality, the “scratches” aren’t scratches at all. They are on the surface of your dishes vs. removing the glaze from your dishes. So, the good news is, you don’t have to repair the plate, but need only to clean it using a mild abrasive. 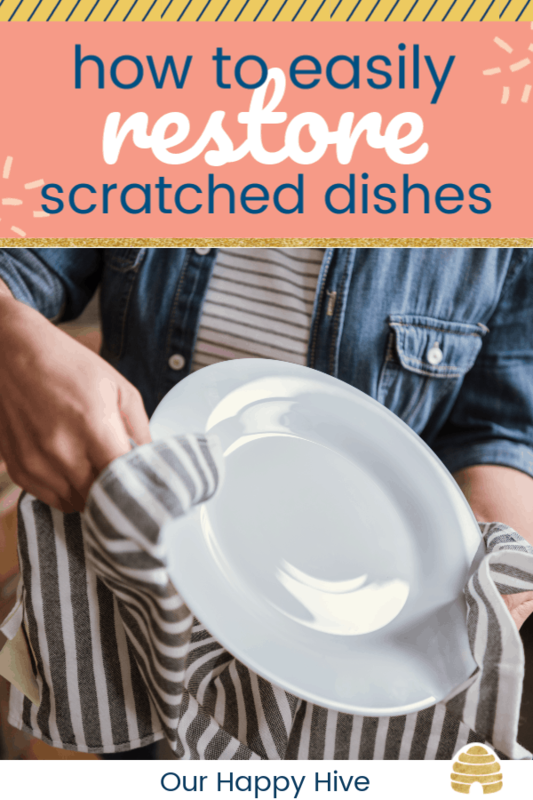 I was happily surprised to learn that I could restore scratched dishes to their original beauty! When I first learned that the plates could be restored, I heard of a product called Bar Keeper’s Friend. It’s a product that’s been around for decades. The powder is very easy to use, you simply wet the plate and sprinkle some powder on it and rub in a circular pattern for one minute then rinse. If the marks are not removed, then do a second time. I only had to go over twice with dishes that were extremely marked. The primary ingredient is Oxalic Acid, so, you’ll want to wear gloves. I also used a green scrub pad to rub the powder into the plate. I was astonished, my plate seriously looked as good as new. While I was pleased to have my shiny plates back, I got a little nervous that I had to take precautions with the active chemical that’s used in the product. Questions started to pop in my head… What if we accidentally use the green scrub pad on things the kids use e.g. Sippy cups? What if the water splashes when I’m rinsing off the plate and gets on the baby bottles? How dangerous is Oxalic Acid? 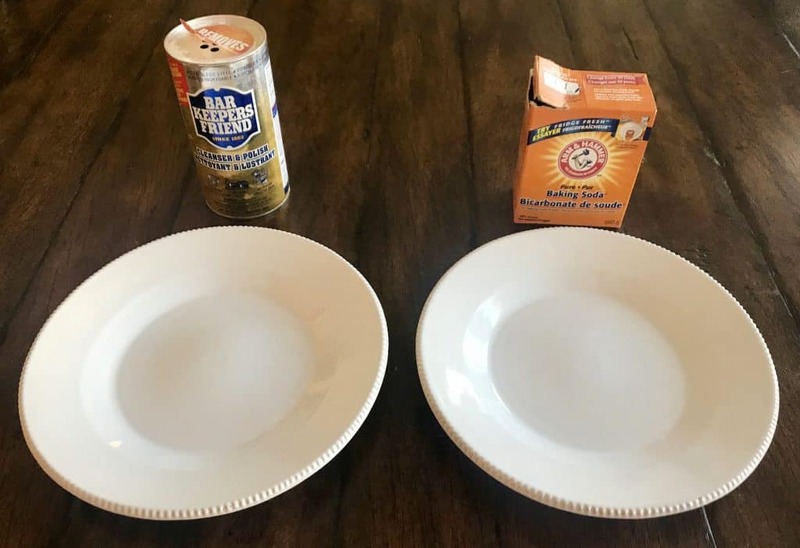 So, I then went on a quest for a more natural approach to resore scratched dishes and to my surprise, a product most of us already have in our homes was the answer. Good ole Baking Soda! EWG rating of “A”! I’m happy to share that it was safe and effective!!! You use it pretty much the same way as the other cleaner. I put a little water on the plate, added the baking soda to create a paste and then scrubbed. I didn’t worry about washing it off within one minute because it wouldn’t damage my plate. Also, I didn’t worry about it splashing on anything and causing harm to my family. To be honest, I did have to scrub a little harder and it probably only removed 95% of the marks. I could see a faint line from one of the darker marks on my test plate when I was done cleaning it. With that said, I didn’t have to worry about exposing my children to a potentially dangerous substance. Bottom line, I was really happy with this natural alternative and it will be the one we use going forward. Speaking of going forward, you may be wondering how frequently you should remove marks from your dishes. 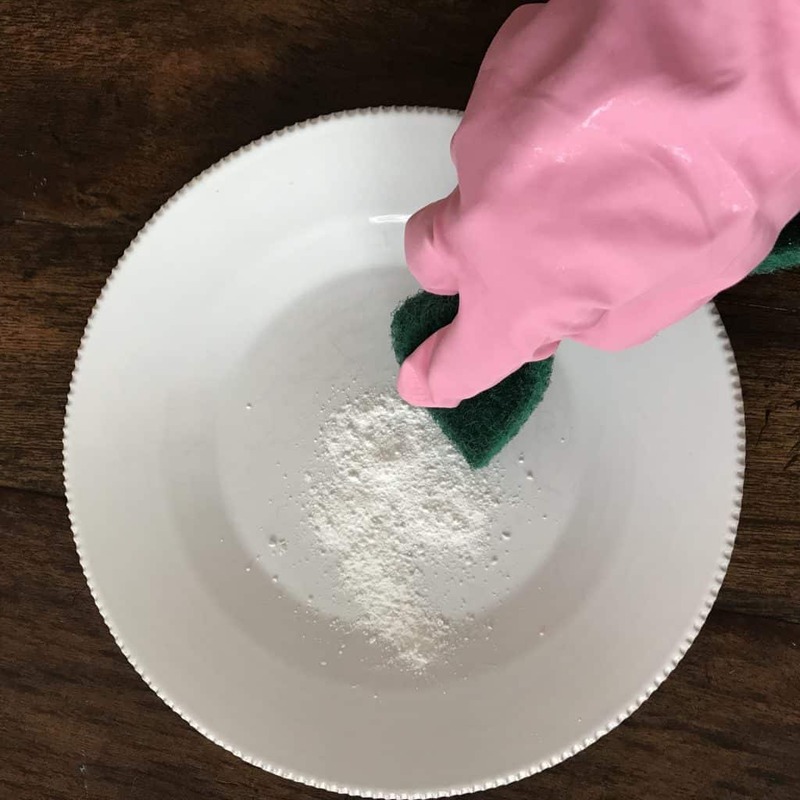 Generally speaking, lighter marks are easier to remove than darker marks (especially if you’re using Baking Soda) so, some may recommend cleaning them every few months. Practically speaking, that’s not going to happen in my house. This is the sort of thing I’d do on an annual basis! As a busy mom, I don’t typically have a couple of hours to dedicate to a project. This process doesn’t take a ton of time per dish, but if you have a lot of dishes, it will add up. As with most tasks for busy moms, I’d recommend breaking it down into manageable chunks. One day do the saucers, the next do the salad plates, another day the bowls. It’s doable for me to find fifteen minutes here or there, but rarely an hour of two to take on the full task. If you have plates with grey marks, don’t count them, out…take heart, they can be restored!!! You can get stellar results by using either Bar Keeper’s Friend, or Baking Soda, a safe and natural product, once or twice a year. 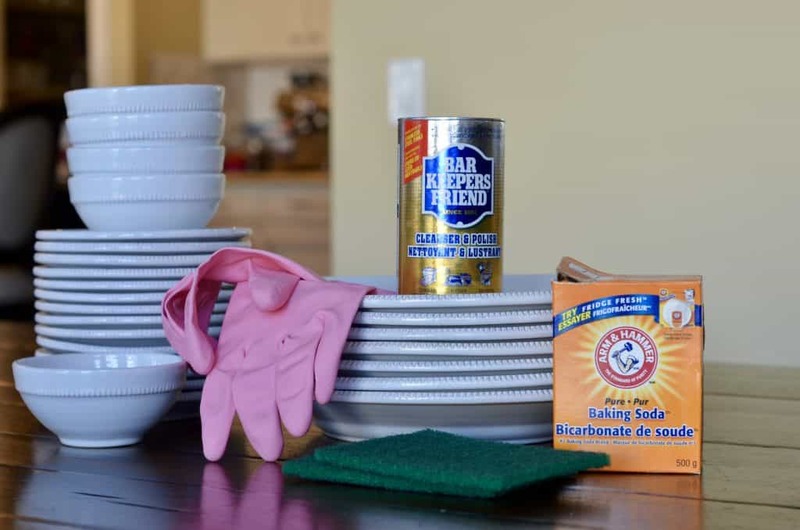 The cleaning process doesn’t have to take long, but can be broken into manageable chunks! Best of all, your favorite plates are saved and can be used for a long time to come!